This week, state-backed researchers fueled fresh debate on the issue with a new proposal on how to coax more productive years out of China’s silver-haired generation. They called for gradually extending the country’s statutory retirement thresholds over the next three decades, culminating in a flat retirement age of 65 years. But their plan is proving unpopular. It is particularly striking a nerve among some women, who in China can retire between five and ten years earlier than men. The statutory retirement age for men is set at 60 years. On social media, many female users mocked what they perceived as selective pursuit of gender equality. “In 2045, would there be equal pay between men and women? Would men be able to give birth?” a user, who identified as female, wrote on the popular Weibo microblogging service. “Chinese society, in reality, is rife with gender inequality; why bring about gender equality in retirement age?” another user wrote. The proposal from the Chinese Academy of Social Sciences comes amid a longstanding debate in government and academic circles on how to implement a much-needed but deeply unpopular policy. 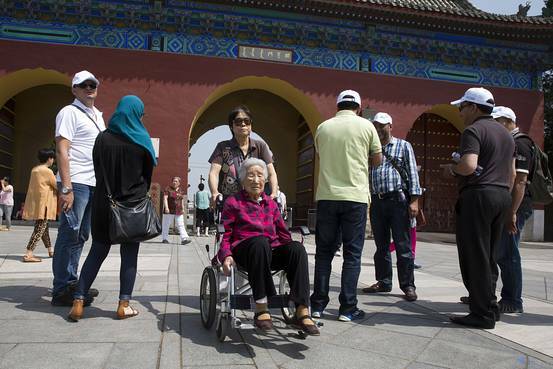 Beijing has said it will gradually raise retirement thresholds starting in 2022, though the policy would only be finalized in 2017. Under rules unchanged since the 1950s, China allows most female workers to retire when they turn 50, while women in public-sector jobs can do so at 55 years of age. To change this, the CASS researchers proposed that the government could in 2017 set a flat retirement age for women at 55 years, eliminating the distinction between private and public-sector workers. Authorities could begin extending retirement thresholds—for men and women—at a fixed pace, starting in 2018. CASS researchers suggest adding a year to the female retirement age every three years, while doing so for men every six years. Beijing could also allow flexibility for workers to bring forward or delay their retirement by up to five years, on the condition that their pension payouts would be adjusted accordingly, CASS said.